88 SMT Magazine • January 2017 nistic leads to many years of work for the NBD individual. Qualification Phase The qualification phase is one of the more difficult phases of the sales cycle for the NBD professional as they must always remember they are a business person first, a sales professional second. In this phase, MC Assembly NBD has the responsibility to uncover the possible man- ufacturing, technical support and business mod- el "fit" between the OEM and the EMS compa- ny. What are the real needs of the OEM and does the OEM value the service offerings sup- plied by the EMS? At MC Assembly, this phase determines if we will invest the company's time and resources in trying to complete a success- ful sales cycle. Additional considerations usual- ly addressed at this stage should include ques- tions such as financial viability, the outsourcing strategy employed by the OEM, and timeframes needed to invest in the outcome, as just a few examples. 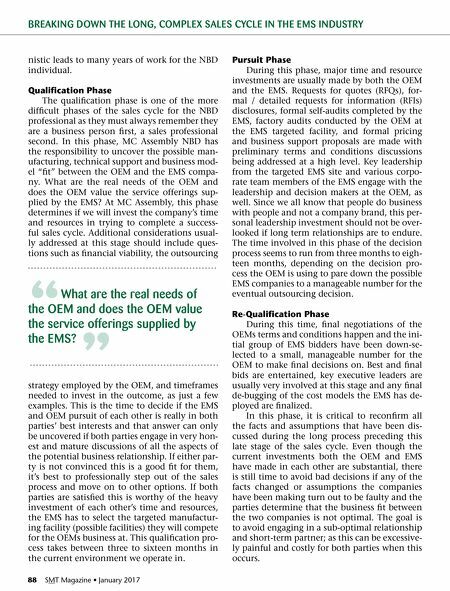 This is the time to decide if the EMS and OEM pursuit of each other is really in both parties' best interests and that answer can only be uncovered if both parties engage in very hon- est and mature discussions of all the aspects of the potential business relationship. If either par- ty is not convinced this is a good fit for them, it's best to professionally step out of the sales process and move on to other options. If both parties are satisfied this is worthy of the heavy investment of each other's time and resources, the EMS has to select the targeted manufactur- ing facility (possible facilities) they will compete for the OEMs business at. This qualification pro- cess takes between three to sixteen months in the current environment we operate in. Pursuit Phase During this phase, major time and resource investments are usually made by both the OEM and the EMS. Requests for quotes (RFQs), for- mal / detailed requests for information (RFIs) disclosures, formal self-audits completed by the EMS, factory audits conducted by the OEM at the EMS targeted facility, and formal pricing and business support proposals are made with preliminary terms and conditions discussions being addressed at a high level. Key leadership from the targeted EMS site and various corpo- rate team members of the EMS engage with the leadership and decision makers at the OEM, as well. Since we all know that people do business with people and not a company brand, this per - sonal leadership investment should not be over- looked if long term relationships are to endure. The time involved in this phase of the decision process seems to run from three months to eigh- teen months, depending on the decision pro- cess the OEM is using to pare down the possible EMS companies to a manageable number for the eventual outsour cing decision. 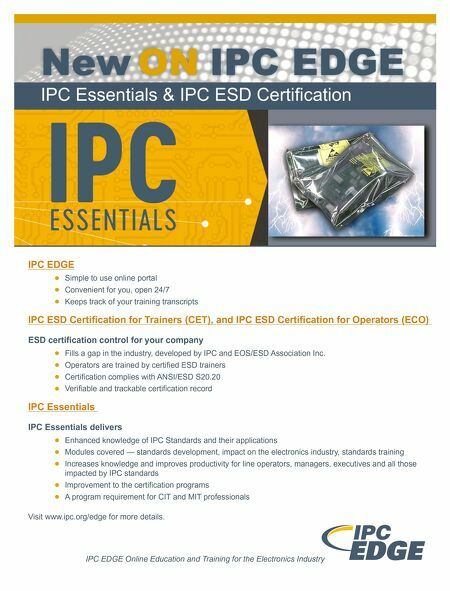 Re-Qualification Phase During this time, final negotiations of the OEMs terms and conditions happen and the ini - tial group of EMS bidders have been down-se- lected to a small, manageable number for the OEM to make final decisions on. Best and final bids are entertained, key executive leaders are usually very involved at this stage and any final de-bugging of the cost models the EMS has de- ployed are finalized. In this phase, it is critical to reconfirm all the facts and assumptions that have been dis- cussed during the long process preceding this late stage of the sales cycle. Even though the current investments both the OEM and EMS have made in each other are substantial, there is still time to avoid bad decisions if any of the facts changed or assumptions the companies have been making turn out to be faulty and the parties determine that the business fit between the two companies is not optimal. The goal is to avoid engaging in a sub-optimal relationship and short-term partner; as this can be excessive- ly painful and costly for both parties when this occurs. BREAKING DOWN THE LONG, COMPLEX SALES CYCLE IN THE EMS INDUSTRY " What are the real needs of the OEM and does the OEM value the service offerings supplied by the EMS? "